Marcus Blyth and Joanne McFadyen and their children Byron and Emerald, have spent hundreds of hours on the restoration of Woodcot Park at Tarraville near Port Albert. 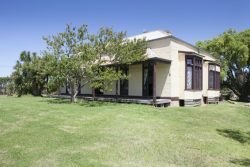 Built by James Neilson overlooking the river and nearby township where he already owned a hotel and other buildings, the homestead was in a sorry state when the family purchased it in 2011. Starting with rescuing the bay windows, their dedication saw interior walls finished in traditional lath and plaster and then wallpapered, all timber finishes replicated where necessary and appropriate interior soft furnishings used to complete the rooms. Exterior works, fencing and the garden continue. The family received $2000 from the Heritage Council and $1000 cash and $1000 in products from Haymes. Now entries in the next award are being sought. 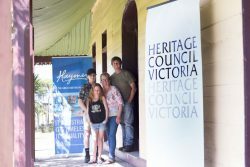 Nominations for the next award should be sent to heritage.council@delwp.vic.gov.au, outlining the works completed and traditional trades utilised and include before and after images. All works must have the required approvals from relevant authorities.